There is a guerrilla war going on in the middle of the Georgian capital, Tbilisi. But this is no armed conflict. It’s a struggle over green space and greenbacks, and one with important implications for grassroots activism throughout the region. The offshoot of a global campaign to garden wherever concrete threatens to prevail, Tbilisi’s self-proclaimed “guerrilla gardeners” have so far succeeded in planting trees and in halting construction of a $20-million luxury-hotel project. In Tbilisi -- a city of roughly 1.17 million, where construction provides much-needed investment and jobs -- that’s a result that gets attention. Preventing the hotel from going up was not the initial motivation for launching this guerrilla movement. “In the beginning, all we wanted was to plant some trees,” said Nata Peradze, a wiry, 40-something woman who leads the movement in Georgia. No current environmental assessment exists for Tbilisi, but activists and city officials alike believe that the ratio of green-space-per-person in the city has fallen far below both the official Soviet-era norm of 13-to-15 square meters per capita and the World Health Organization’s recommendation of at least nine square meters per capita. Styled by Georgian media as the Joan of Arc of the country’s green awakening, Peradze, a onetime employee of the city’s landscaping office, had firsthand knowledge of the decline and decided to do something about it. Her volunteer initiative is so far responsible for planting 300 trees since last July, she says. In late 2013, Peradze and scores of helpers recruited via Facebook, occupied a patch of land in the upscale neighborhood of Vake on which the Tiflis Development Company, a Georgian-Kazakh concern, intended to put up a seven-story hotel. Peradze’s group contends the plot is part of Vake Park, a sprawling, publicly owned oasis of green, and thus should be off-limits to commercial development. The fight pitted the group against two of Tbilisi’s most powerful interests -- City Hall and a development company. Yet, so far, the gardeners have the upper hand. Wary of protesters throwing themselves in front of bulldozers, the hotel-builders gave up their attempts at felling trees back in January. But the guerillas, fearing covert construction, have remained. The first major offensive on the city’s green spaces came two decades ago, when the post-Soviet collapse of electricity and heating systems prompted many residents to chop down trees for fuel. Then came the development boom, during which local officials, hungry for investment, made sure neither regulations nor century-old trees stood in the way of new buildings, environmental activists complain. Officials at Tbilisi City Hall maintain they’re just as interested in trees as anyone. In the case of the Vake hotel project, though, City Landscaping Service Director Giorgi Korkashvili contends the site sits outside Vake Park’s official borders, and thus there are no legal grounds to stop construction. Peradze’s group filed a lawsuit last week seeking judicial backing of their interpretation that the plot in question is within a recreational zone. Chances for a non-litigious settlement of the dispute appear remote. Meetings with Tiflis Development and City Hall officials so far have failed to yield a hint of compromise. Activists, for their part, see the city government as their main foe and blame it for allegedly persistently favoring private business interests over community interests. That argument is not limited to Georgia alone. In neighboring Armenia, a 2012 sit-in protest managed to block commercial development of Yerevan’s Mashtots Park. 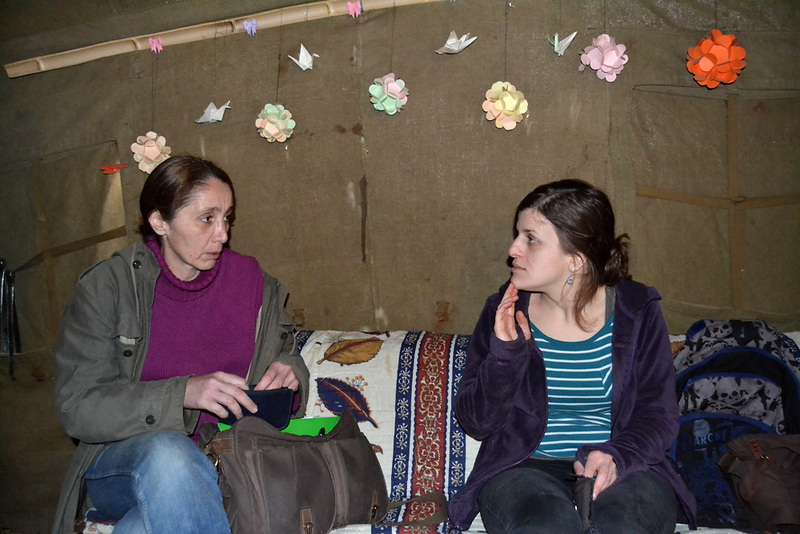 Members of the Mashtots movement, along with other foreigners, have offered support for Tbilisi’s guerilla gardeners. Peradze argues that much of the trouble in the Georgian capital stems from the lack of strategic vision and any master plan for maintaining the city’s greenery. Korkashvili counters that the landscaping service was only formed in 2009, and that such a master plan is in the works. In the absence of a fully developed concept, urban planning decisions can seem helter-skelter. Many residents are disgruntled by the disappearance of mature trees and the planting of expensive, exotic saplings or hanging flower baskets – practices that are often attributed to incompetence and/or graft. Anti-corruption watchdog Transparency International reported in 2012 that the city government purchased 120 cypress trees from a company owned by two former senior city officials for 990 laris ($574.58) apiece; a price more than 30 times the cost of earlier tree purchases. Amid a public outcry, the mayor’s office cancelled the contract. Giorgi Lomsadze is a frequent contributor to Eurasianet's Tamada Tales blog.